How to add label to a Swing frame in Java ? 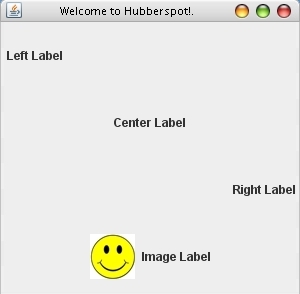 Program to demonstrate adding of a Label to a Swing component in Java. How Cast Operator works in Java with example ? How to solve Simple Quadratic Equation in Java ?. How to calculate Compound Interest in Java ?. How to calculate Simple Interest in Java ?. How to use Hashtable in Java with example ?. How to use HashSet in Java with example ?. How to use TreeSet in Java with example ?. How to use LinkedList in Java with example ?. How to use GridLayout in Java using Swing ?. How to use FlowLayout in Java using Swing ?. How to use BorderLayout in Java using Swing ?. How to use Vector in Java with example ?. How to create a simple JavaBean component ?.